Lush Fab Glam Inspired Lifestyle For The Modern Woman: Ad Fab: Madonna's Sassy New 'Truth or Dare' Fragrance Campaign! 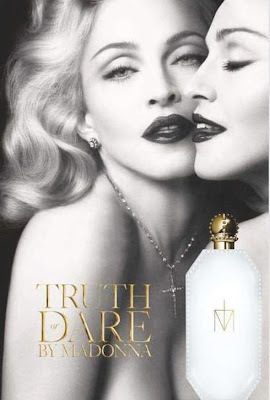 Ad Fab: Madonna's Sassy New 'Truth or Dare' Fragrance Campaign! Here is a sneak peek of Madonna's﻿ upcoming fragrance 'Truth or Dare' which will be available on April 1st exclusively in the Women's Fragrances at macy's department/online store. Photo by Mert & Marcus for Interview magazine. Madonna described the fragrance by saying "I have always been obsessed by fragrance and for years wanted to create something personal that was an expression of me but that other people could relate to as well: something honest, and yet daring, hence the name Truth or Dare." What do you think of Madonna's 'Truth or Dare' ad campaign photo and will you be trying her new fragrance? Leave a comment below. Cool photo I like the concept.